Published in Viator (here) and Huffington Post (here), 2013. The two thousand year old city that is London is a living, breathing history book. While Samuel Johnson was right: “There is in London all that life can afford”, often what we locals like doing most is to haul up in the pub. Luckily, we need not choose between comfort and culture when looking for a watering hole around London town, because so many pubs are rich in historical and literary connotations. So get your pint and find a seat by the fire, underneath low beams on crooked floors, and get merry in the knowledge Dickens may well have sat in the very same spot. One of many London pubs with a Charles Dickens connection, it’s easy to see the author penning some of his gloomier stories at Ye Olde Cheshire Cheese. The atmosphere comes from the lack of windows, but take this as is part of the charm as you crawl through the many little rooms inside. There’s been a pub in this spot since 1538, but the one there today was re-built after the Great Fire of London. Dickens’ novel ‘A Tale of Two Cities’ makes a reference to this pub, when the characters make their way along Fleet Street “up a covered way, into a tavern … where Charles Darnay was soon recruiting his strength with a good plain dinner and good wine”. Whether it’s true that this pub sits at the site of the city’s oldest riverside tavern is not certain, but this is still a great place to have pint by the Thames. Legendary diarist Samuel Pepys drank here, but the pub also features in newer works of fiction: Vercors’ 1952 novel Les Animaux dénaturés, and the famous English comic book series ‘The League of Extraordinary Gentlemen’. This classic London pub was once the epicentre of the city’s literary bohemians, drawing custom from the likes of Dylan Thomas, George Orwell and Augustus John. Originally a coffee house when it was built in 1883, it became a pub only a few years later and has stayed true to these roots ever since. Fame or infamy depends on who is asked, but between the 1920s and 1950s it was a popular after-work hangout for Orwell and Thomas who worked at the nearby BBC. Today it hosts the weekly gatherings for the alternative student magazine at University College London. This is where Samuel Pepys sat when he watched the Great Fire of London in 1666, taking refuge in “a little alehouse on bankside … and there watched the fire grow”. The building standing in this spot today has gone through several modifications, not all of them for the better, meaning the best spot to sit and soak in the atmosphere today is probably the large seating area overlooking the Thames. Regardless, this is the only remaining pub in an area once popular for riverside inns around the time of Shakespeare. The site of his original Globe theatre is only a block away (the new building by the river is a replica), meaning there’s a good chance the playwright would have drank at The Anchor. “Who would want to hang out around the Pillars of Hercules? Only those bent by this passion for writing books. We were absolutely determined to become writers. We didn’t use words like ‘passion’, but we acted them out. Writing was the only important thing,” Ian McEwan recently said in an interview with The Guardian. The author would spend time in this Soho establishment with his literary friends Martin Amis, Julian Barnes and Christopher Hitchens. The pub itself stems back to 1733, with ties also to Casanova, Thomas De Quincey and Charles Dickens. A literary classic, The Spaniards Inn remains a gem of a pub with beautiful oak panels and a great beer garden, where you can find such a rarity as a panoramic view of London. Dickens mentions the Spaniards in his novel ‘The Pickwick Papers’, Bram Stoker names it in ‘Dracula’, and Keats allegedly wrote ‘Ode to a Nightingale’ in the garden. The Spaniards remains a great end point after a walk across Hampstead Heath, with a live fire and brews on tap to get the warmth back in your body on a chilly day. Posted on 12/28/2012 by Jess. 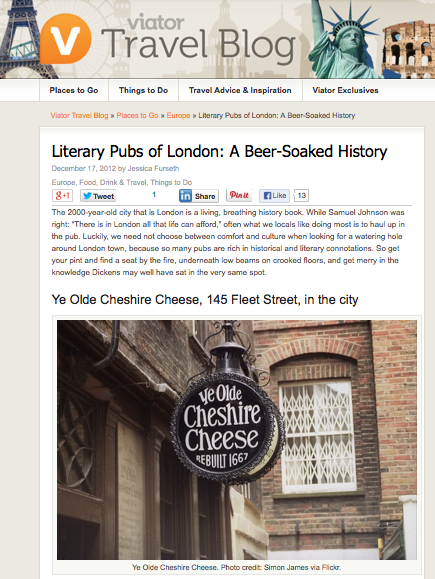 This entry was posted in Travel writing and tagged blog, london, pubs, travel, viator. Bookmark the permalink.